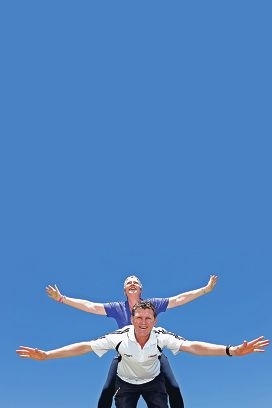 Atwell resident Trevor Touzel and 27 others are planning on doing just that when they freefall from 14,000 feet as part of Breast Cancer Care WA’s second Jump for Jane skydive challenge on October 25. The event was created in honour of former BCCWA board member Jane Loring, who died from the disease in early 2013. The event will hold even more meaning for Mr Touzel, whose wife Ali was diagnosed with the disease in July this year. Earlier this year the Touzel family shaved their heads to raise more than $3000 for the group. To help raise more funds and awareness Trevor has decided to take the skydive challenge, jumping from a plane and landing at Perth’s Langley Park. ‘It’s been a really emotional rollercoaster,’ he said. ‘Following the operation Ali went through six months of chemotherapy, which had its ups and downs. The journey itself really encouraged Ali and her faith. Trevor said the height would have him nervous come jump time. ‘I’m a bit of an adrenaline junkie ” I like doing things like that. I think on the day I’ll be pretty excited but also fairly scared,’ he said.